This is a guest post by K. T. Lynn. If writing is your passion, then you need to live your life accordingly. 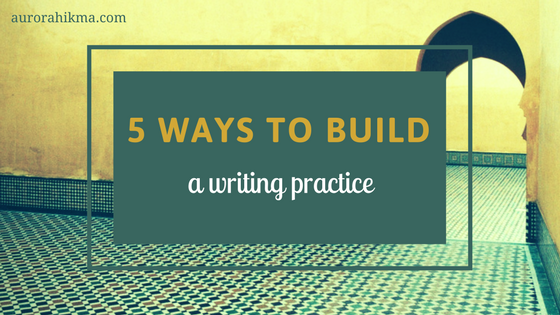 Instead of squeezing in writing where you can, build your day around it. Schedule blocks of writing time as you would any important appointment. Prioritize your writing practice by focusing fully on the task at hand – eliminate distractions. Set goals that slightly stretch your capability. If the most you have ever written in one sitting is three hundred words, stretch to four hundred, then five hundred, and so on. If you have trouble blocking out large chunks of time, write in ten minute “word sprints” . Unreasonable goals can impede progress. Take it slow. Experiment to determine your writing “sweet spot”. Track your writing productivity daily. Try different times of day and locations. If you normally write on a computer, journaling prompts and writing long hand can be a nice change. Some writers require complete silence and a laptop, others a noisy coffee shop and a notebook. Find what works best for you. Although the best way to improve at writing is to actually write, learning about the craft is extremely important. I recommend reading books on the craft such as On Writing by Stephen King and DIYMFA by Gabriela Pereira. Writing courses can be another invaluable resource. Writer’s Digest and Udemy have writing courses on a variety of genres such as fiction, travel writing, and memoir. If you’d prefer in-person to online, check your local community college, learning center, or university for writing courses/workshops. Although the act of writing can be very lonely, it is completely meaningless without community. Build your community by attending writer’s conferences, workshops, retreats or group meetings. Most of us look to our audience for support, but fellow writers can offer feedback, collaborative opportunities, or simply a shoulder on which to cry. Writing is a craft, art, and profession. With it comes many things outside your control. Talent is subjective. Luck is finicky. Only dedication and work ethic are controllable. All we can hope for is to string together a few beautiful words together along the way. “Contrary to common perception, being a writer consists of more than pounding laptop keys while sipping lattes at your local Starbucks.” This line made me laugh so much! It’s so true!!! Great article with some great tips. I think this all relates to blogging aswell. Great information you have shared. I think if it’s a hobby too it will last long and more passion to it. #3 is dead on, Knowing yourself is quite and endeavor :)! These are good points! When you have your mind set this way it makes it easier to put out good content and not feel overwhelmed. I like having a list of topics written and I love to draft in advance when the food strikes, final editing and pictures can come later but sometimes we all have that burst of inspiration to just write and we should take advantage of it. This is a fab post – as I’m just getting into focussing on my blog and writing more – I never thought to approach it with some of your tips- than you!